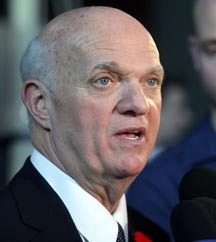 Providence, RI (6/24/2011): In recognition of his enormous hockey accomplishments, the R. I. Reds Heritage Society will present Lou Lamoriello with its second “R. I. Native-Born Hockey Achievement Award” at the society’s 11th annual reunion at Goddard State Park in Warwick on August 7. Last year’s inaugural award was awarded to ex-Olympian goaltender, Sara DeCosta. Rhode Island’s own native son has spent more than two decades building the New Jersey Devils into a top organization. Under his leadership as president and general manager his Devils have captured three NHL Stanley Cup championships, losing another in the seventh game. He was also the architect of the 1996 American team that upset Canada to win the World Cup of Hockey. Lamoriello received the greatest tribute to his long career of hockey excellence on November 9, 2009 when he was recognized for his contributions to hockey by being inducted into the “builders” section of the prestigious Hockey Hall of Fame in Toronto. His fascination with hockey began here in the Ocean State when he was a youngster. He attended the R. I. Reds games at the old R. I. Auditorium on a regular basis and his mom and dad frequently entertained the players at their Lamoriello restaurant in Providence and homestead in Johnston with post-game servings of good old Italian-style food. Today, at age 68, he is one of the most respected executives in all of hockey. In high school he starred in hockey and baseball at LaSalle Academy, then moved on to Providence College where he became one of the hockey team’s leaders under coach Tom Eccleston, himself a legend of hockey strategy at that time. Shortly after graduating, Lamoriello became head coach of the Providence College hockey program, mentoring such players as Ron Wilson and Brian Burke. Later, he added the duties of athletic director at PC and was the driving force in the 1984 formation of Hockey East, today one of the nation’s top collegiate conferences. Catching the eye of the Devils owner Dr. James McMullen, PhD, he was hired as president of the Devils in 1987 and became the team’s general manager the very next year. Since then New Jersey has made the playoffs 19 of 22 seasons and had a run of 12 consecutive post-season playoff appearances. He has served longer with any present GM with the same team and even made several spot appearances as coach of the Devils where his record was 44-24-5. The R. I. Reds Heritage Society reunion committee says their 11th annual reunion at Goddard State Park, Sunday, August 7, has already sold 172 tickets, well over half of the location’s capacity of 300. Deadline for reservations is July 16. No tickets will be sold at the gate.